The latest Zero Latency Gen 2 free-roam VR hardware has arrived, touting more power and new features afforded by upgraded Microsoft and HP components. The virtual reality gaming industry is still playing host to rapid technological advancements, and Dark Slope as well as free-roam VR developer Zero Latency are keen to make use of the latest technology. Unlike many other VR games, Zero Latency experiences are played in specially designed warehouse-sized rooms and rely on up to eight separate untethered VR systems. The previous generation of the developer's technology was relatively outdated by modern standards, which is why the Zero Latency Gen 2 hardware was built almost from scratch with new components from both Microsoft and HP. For its previously released games, Zero Latency used a small Alienware PC connected to OSVR HDK2 headsets packed into (and onto) custom-designed backpacks. 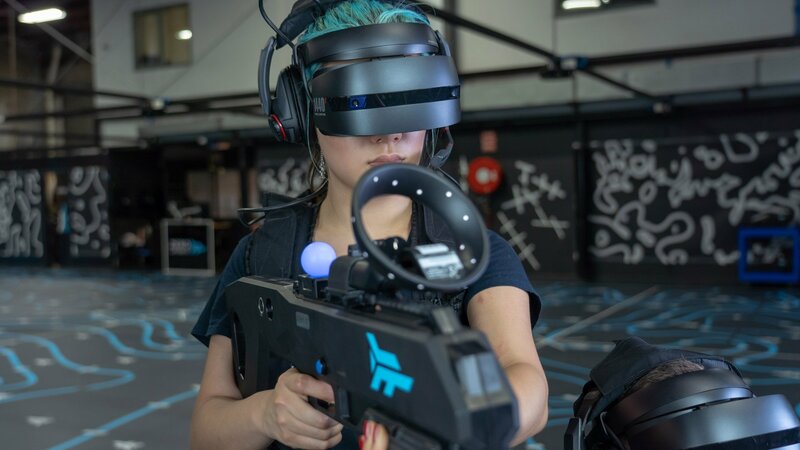 Coupled with a Razer headset, a hefty bespoke light gun, and Zero Latency's own tracking system and camera array, players are able to move around and shoot at one another in simulated 3D environments. This freedom of movement is critical to Zero Latency's latest game Sol Raiders, the studio's first attempt at a free-roaming VR game with esports ambitions. However, by modern standards, that technology may as well be ancient. Instead of trying to adjust it to suit evolving needs, the team have essentially thrown out everything save for the gun peripheral. The new Zero Latency Gen 2 platform uses the Windows VR headsets and the Z VR backpacks made by HP alongside Windows VR for tracking. According to a report from Road to VR, the new hardware means the team was able to shift from outside-in tracking to inside-out tracking, removing the need for Zero Latency's previous camera array and tracking systems. As a result, players and developers alike can enjoy more accurate in-game movement and more precise tracking than the previous generation hardware allowed. Alongside the announcement of its Gen 2 platform, Zero Latency also announced a partnership with Dark Slope Studios to bring VR experience Scarygirl Mission Maybee to Zero Latency venues spread across the globe. This marks the first time a third-party-developed game has been released for the Zero Latency free-roam platform, and it's available to check out now at any Zero Latency location running the second generation hardware. Any game fans interested in learning more about Zero Latency's free-roaming VR experiences should read Shacknews' interview with Zero Latency CEO Tim Ruse, which touches on how the studio creates its games as well as its hopes for the budding VR esports market. For all other gaming and VR news needs, keep it tuned right here to Shacknews.